The Eighth Annual TAEA Member Art Exhibition - “Connections”, will feature artwork created by Tennessee art educators, offering teachers the opportunity to display their talents and be honored for their accomplishments in a professional environment. The art educator exhibition also provides an excellent venue to show the relationship or “Connection” of exemplary student art with that of their instructors and the high quality programming that the TAA provides in its summer enrichment experiences. The Eighth Annual TAEA Member Art Exhibition is a juried show open to all current 2017-2018 TAEA members. No more than two (2) entries per member may be entered and must be in the form of high-resolution JPGs (minimum 300 dpi). Please crop to show artwork only (crop out mat, etc.). Please label each image with the full name of the artist, title, medium and size of the piece. For example: John Smith-“Sunrise”-painting-30x40. E-mail images to: jdodsonart@aol.com and also to jdodson@ortn.edu (Please include phone number and mailing address with email submission!). All entries must be received by March 21, 2018. As we continue into the New Year, I’d like to share a little insight from a 40 year career as an art educator. Number one on my list is “It’s okay to ask for something!” I waited a long time before I had the courage to ask for something that I needed in my classroom. I thought I was being greedy or that they would say no. And sometimes they did say no. But, that’s okay. No, is an okay answer. If you don’t have something and the answer is no, you still don’t have it, so you’re even. If the answer is Yes, then you are ahead! You might be wondering who they are. My first Supervisor always called “them”, “the powers that be.” “The powers that be” could be your Principal, your Supervisor, the School Board, the PTA at your school, or even the Junior League in your city. After I got over my fear of the “Powers that Be”, I realized that they were not my enemy and most of the time they tried to help me. I was very fortunate that I got many things for my classroom. I asked for Scholastic Art Magazines and the PTA helped me out for several years. I asked for a copy of “Drawing on the Right Side of the Brain” and did a workshop with some of the School Board members. I was surprised with a class set of the paperback books. Another time, the art department had some extra money and I got an email asking if I needed anything. I called the office and said I’d really like a class set of Printmaking books since I taught a lot of printmaking and didn’t really have many examples to show them. There wasn’t a high school textbook at that time, but there was a book about Printmaking that I suggested. I got a call several days later that no one else responded and they were going to buy me the class set of books. Yay!!! As you know, I ended up writing a Printmaking textbook for high school, and yet, I never had a set in my classroom to use with my students. This is the year for textbook adoption for Art, Music and P.E. If you haven’t already, ask what is available for you. The next adoption for Art won’t be for 7 years, so now is the time to ask. You can go online and see the list of books available. There are about 11 different art books and about 100 different music books. Again, there is no Printmaking book on the list. I am working on a digital version right now, so maybe next time. That would be 7 years from now! I hope you decide to ask for what you need. Greetings to all the TAEA art educators during this holiday season! As I am rolling off as your President, I wanted to take a moment to recap the TAEA activities this past year. TAEA has been updating by making the changes needed to make us relevant to all our members. We have added online meetings for the board, so we can meet four times a year to keep up to date. We have created committees that bring in non-board members as well as board members. Our website has been revamped to bring current information to our members, as well as letting members comment directly with questions. Our Communications Committee has put us on Twitter, Instagram, and yes, we are still on Facebook. We had 3 Regional conferences, one in Memphis, one in Franklin, and one in Knoxville throughout the spring semester. Please look for more information on this year Regional Conferences coming up soon! I hope more of you put your students’ artwork in TAEA’s Regional Student Art Exhibitions. Each region hosts a student exhibition where the students can earn cash and scholarship prizes. Check the website for more information. As always, if you want to help us in anyway, you can contact your regional chairs, your divisional chairs, or anyone on the board. Our emails are on the website also. I also wanted to make sure all TAEA/NAEA members that NAEA has an election right now on Regional VP-Elects and President-Elect. All members should have received an email from NAEA with a specific voting number to use with your membership number to vote for NAEA SE Regional VP-Elect and NAEA President. Look in your email from December 1st…check spam folder! Let your vote count on the National level also! This vote is over in early January. Thank you for the privilege of leading TAEA these two years as your President. I am on to my new role as Past President at the beginning of the year, which has the responsibility of organizing the next two Fall conferences. Next fall, November 1-3, 2018, we will be in Arrowmont in Gatlinburg! Please make plans to attend! We recently wrapped up our 2017 Fall State Conference, “Every Artist Tells a Story,” in Memphis (October 26-28), hosted by Memphis College of Art, (MCA) with over 120 members participating in nine Two-Day Workshops and thirteen Super Sessions! Arts Memphis provided a scholarship grant for twenty participants to attend our conference. Shelby County Schools recently provided NAEA/TAEA memberships to all of their district art teachers which immediately helped bump up our membership and add to the success of our conference. Our keynote speaker was artist and art educator Olivia Gudewho is the Angela Gregory Paterakis Professor of Art Education at the School of the Art Institute of Chicago and Professor Emerita at the University of Illinois at Chicago. Friday morning registration began with a breakfast sponsored by Memphis College of Art. Participants received a red swag bag full of art goodies donated by local and national vendors. After the morning address and super sessions, lunch was provided by The University of Memphis. Super Sessions included “Digital Curriculum and 21st Centruy Art Education” led by a conference special guest and SchoolArts Editor, Nancy Walkup. Oilsticks with Paul deMarrais, Painting with Scott Manning, Clay with Wendie Love, Blacksmithing with Bill Price, Monotype Printing with Koichi Yamamoto, Fibers with Grace Eckert, Steampunk with Melody Weintraub, 3D Printing with Cat Normoyle and Sketchbooks with Joseph Christy. Following the first day of workshops, attendees heard the keynote address by Olivia Gude and then everyone moved upstairs for the Friday Night Reception. Food for the reception was hosted by Memphis College of Art. The reception included a live band, three hands-on workshops, vendors and an Artisan’s Market. The highlight of the evening for many was the Amurica Photo Booth Trailer where participants got their photos made and printed for a tip donation to Youth Art Month (YAM). Saturday began with another keynote by Olivia Gude who shared her work with community collaborative mosaic murals. The audience was inspired by her work as well as her passion for visual arts education. Following her keynote, Amanda Galbraith, Kathy Dumlao, Heather Casteel, Angela Christopher and James Wells lead all attendees in a Breakout Session, “Creating an Arts Education Future.” Sessions included sharing student success stories, creating belief and position statements, crafting an influential message and establishing priorities for art education in Tennessee. This also included a selfie-video challenge where participants recorded a personal statement about, “Why Art Matters!” These videos were then uploaded onto social media sites as advocacy tools. If you haven't been hearing about the big pushes towards STEM education, you've been under a rock. Many school districts are advocating for STEM-based learning in the classrooms. Oftentimes, this leaves art teachers on our own. We all know how important the arts are in a child's education and how applicable our subject is to science and engineering. But maybe you're looking for a stellar project that will really show your administrators that Art is an important STEM subject. Look no further that our 3-D Printing workshop with Cat Normoyle. This workshop will supply all the details involved in bringing 3D printing into your classroom. Cut through the confusion. How exciting, to make a 3D object from a digital design. Learn the basics so that you can prepare your students for this experience. Participants will print 3D items for take home. All materials will be supplied. Cat Normoyle is a designer, artist and educator who recently moved from Atlanta to teach design at Memphis College of Art. The assistant professor in Design Arts, teaches a range of classes from advertising, packaging, typography, print design and drawing. She has a BS in Industrial Design from Georgia Institute of Technology and received her MFA in Graphic Design from Georgia State University. When she’s not in the classroom, you can find her in the studio working on unique ways to fuse graphic design in public urban spaces. She enjoys working in places (both outdoor and indoor) with regard to social positive impact. Some of her most recent work deals with adding meaning in abandoned, neglected, or forgotten spaces. You can see examples at catnormoyle.com. Cat presented at the Cumulus Art and Design Conference in Hong Kong in November 2016. NAEA student chapters have already begun fundraising efforts for important chapter activities that will occur later in the year. Middle Tennessee State University conducted their first fundraiser of the year by painting designs on small pumpkins and selling them to staff and students. Next on their agenda is a bake sale for the week before Thanksgiving break. Along with the pumpkin painting, the bake sale is also a fundraiser for their planned workshops next spring. They are considering a hand lettering workshop as well as water marbling art and the possibility of polymer clay. Meanwhile, the University of Tennessee, Knoxville’s student chapter has begun raising money for future chapter activities by designing logos for various educational entities. They are currently designing a logo for the East Tennessee STEM Hub. Their vice-president, Heather Eades, will be receiving TAEA’s Higher Student Achievement Award this month. Curious about the Conference Schedule? We are still finalizing some of the details but we are excited to share all of the fun and excitement. Be sure to join us for the Awards Banquet on Thursday night to honor the 2018 TAEA Awardees. The Conference begins bright and early Friday morning with pastries, fruit, and coffee/tea breakfast, followed by our opening presentation by TAEA Past-President and Conference guru, Donna Anderson. The Membership Meeting, presented by Janis Nunnally will take us right up to the first round of Super Sessions. What are Super Sessions, you ask? Super Sessions mini-presentations or workshops about any number of topics. You'll get your choice of which sessions to attend so you'll be sure to find a topic that's right up your alley. Following a lunch meeting with your division leaders (Elementary, Middle, Secondary, Higher Ed, or Museum), you'll be in the studios doing what we all love best, making ART! For 4 hours! After studio clean-up, we will hear from our keynote speaker, Dr. Olivia Gude and party hard at the reception following! Don't go to crazy at the party on Friday because its another early start on Saturday! After breakfast, Dr. Olivia Gude will speak to us again (yay! ), followed by a special presentation about Creating an Arts Education Future. Then, its what you've been waiting for! DOOR PRIZES! You'll have to turn in an evaluation sheet before you can win. After lunch, you've got 4 more hours of workshops and art making! It's going to be fantastic! Won't you join us? To the typical art teacher, clay is a daunting endeavor but to the average student, its just a change to squish some mud! 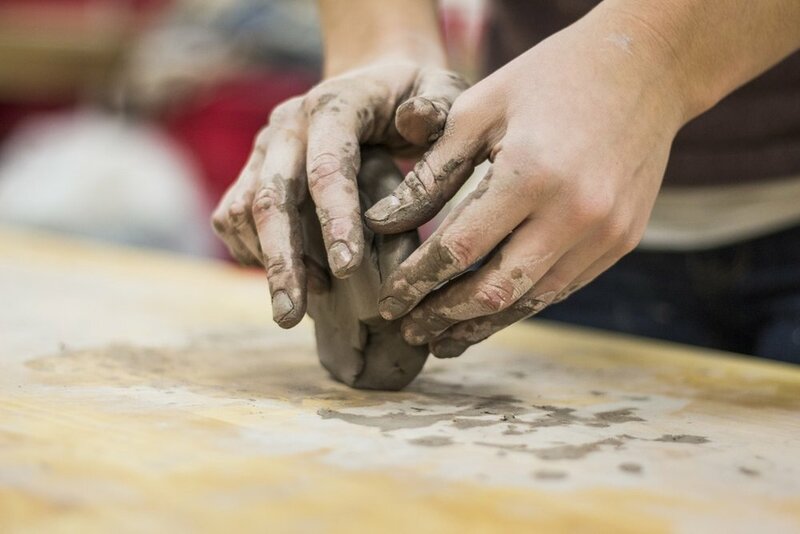 The possibilities with clay are endless, which is one of the reasons students love it so! Whether its a 2-D clay tile with a little relief work or a 3-D vessel, clay is an inspiring medium for students of all ages and all skill levels. Luckily Wendie Love's workshop is all about differentiation and choice through clay. This workshop will offer soft slab techniques that are valuable to all levels of students. Adding breadth and depth to any level of clay studio practice the tools and techniques demonstrated in this workshop will allow participants to explore differentiation in the context of clay. Using roofing paper templates to create soft slab forms; students will have the opportunity to explore, design, and construct a wide range of forms. The work may be sculptural, functional, or decorative. The skills will apply to the classroom and/or personal practice. Sam Chung and Bill Griffith are two artists who embrace these techniques. Their work will be used as a point of reference. Participants should bring: a variety of clay tools, scissors, sketchbook and boxes for transport. Wendie Love’s artwork is primarily influenced by the role of the form and function in art as it enables the building of community. She works to provide an environment and encouragement for young people to imagine and create. Valuing the creative process over the product, she strives to contagiously instill in her students a love research, planning, and the full embrace of the accidental. For her, clay more than other media, provides endless opportunities for technical research, historical appreciation, creative problem solving, and perpetual learning. Art is about process: establish/recognize a problem, imagine potential solutions, create a solution, evaluate and reflect on the quality of the solution, and repeat. In art and in life, she seeks to experience and share a passion for learning while building a creative community. She teaches at Farragut High School in Knoxville, TN.